In 1991, when prog was at it’s uncoolest, when Genesis, Pink Floyd and Yes had gone commercial and when critics used prog as a four letter word, the band Änglagård was formed in Stockholm, with the purpose to create pure symphonic rock like in the 70’s – without cheesy synth sounds or pop influences. For a long time Epilog (1994), seemed to be their final album but after many rumours they did their comeback with Viljans Öga, which topped many best-of-2012 lists and arguably improves the formula set in the early 90’s. 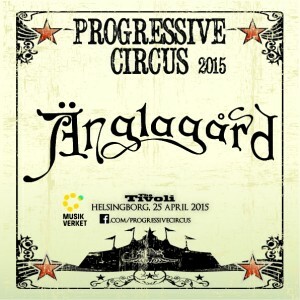 If you want to experience music that sounds like dark Nordic forests, John Bauer paintings and a thunderstorm at once, make sure you DO NOT MISS when Änglagård visits Skåne for the first time at Progressive Circus 2015!!! On stage you will see virtuosos Erik Hammarström (drums/percussion), Johan Brand (bass), Tord Lindman (guitars), Jonas Engdegård (guitars), Linus Kåse (keyboards) and Anna Holmgren (flutes, saxophones). Please note: Helena Bergström and Rikard Wolff will sadly NOT be available for signing your DVD:s and movie posters after the show, due to their non-existence in the band.